Mariposa's Tales MARIPOSA'S TALES: Happy New Year from Cebu, Philippines! Happy New Year from Cebu, Philippines! 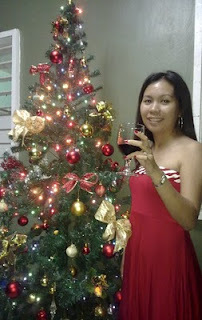 From Cebu, Philippines, we wish you all a happy 2010! May the new year bring you joy, love, good health and success. Cheers! Beautiful thoughts from a truly beautiful woman. Wishing you all the best in the coming year Mariposa. BTW...It's still 2009 here, so your "present" is my "future"
Happy New Year to you and your family and IT Guy, Mariposa! Wishing you joy in the New Year, Mariposa. BTW, get IT Guy to take you to see The Young Victoria. I predict you'll love it, especially the theme song "Only You" sung by Sinead O'Connor. Same to you Mariposa. May 2010 be the best ever for you n yours. Love your dress, you wear it well!